4 panels. 3 sheets. Glued and screwed over chine-logs. Cockpit riser and rim laminated in place. Last edited by tpaetkau; 02-24-2019 at 06:41 PM. looks very good. That's what I would like to build in the future. What's the length is going to be ?? Here's Bolger's take on the instant kayak. I built one of these for my son many moons ago, and it was a much handier kayak than I expected. If a person isn't in a hurry, the bottom shape isn't near as critical as many would suggest. While it might be possible to build a siimple kayak in 24 hours, why would you force yourself into such a tight schedule? Do you have an urgent appointment you have to paddle to? I built my Spindrift 11 in 6 weeks which was something of a record for that build, and it's not that complicated. Forcing yourself to build a boat of any kind in 24 hours is asking for trouble. It is very easy to make mistakes building boats, and just giving yourself time to ponder and think is a good way to avoid most of them. If you do decide to take on the 24 hour challenge, I wish you all the best. Certainly you have chosen a boat that could be built in a weekend if you have everything ready and you know exactly what you are doing. what capacity are you targeting? have you considered creating the ability for expansion to accommodate different sized/weight paddlers? 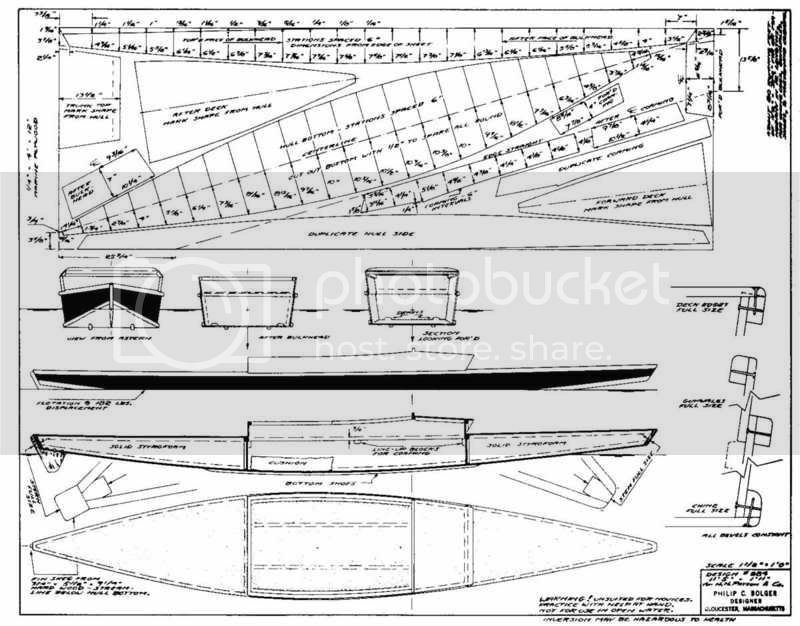 your OP lists wanting others to build, have you considered offering her drawings to a youth/community boat shop group build? I've built over two dozen kayaks. . .and I have to say I don't think your quest is grounded in reality. Certainly not if you have the same definitions for "paddles well”, and "well built" that I use. It's already possible to build a truly excellent kayak for something on the order of 40 hours. Trying to do it a whole lot quicker than that means you're cutting corners. A whole bunch of corners. And for what? What are you gaining, honestly? Less slapdash hurry and more careful craftsmanship, please. You can't bake a great pie with poor ingredients. And even a mediocre pie is going to take a certain amount of time to bake. What's your goal? Owning a great boat? Or getting the building part over with as quickly as possible? Last edited by James McMullen; 01-16-2016 at 08:57 AM. I don't know about the 24 hour part but I made a one sheet boat that was a lot under your price figure. This one is a little under 8 foot long and made from just one sheet of plywood. I used chine logs, glue, nails, screws, just about everything except epoxy. Mine isn't exactly a kayak but paddles much like one. shouldn't take much to get rid of the transom to make it more kayak shape. 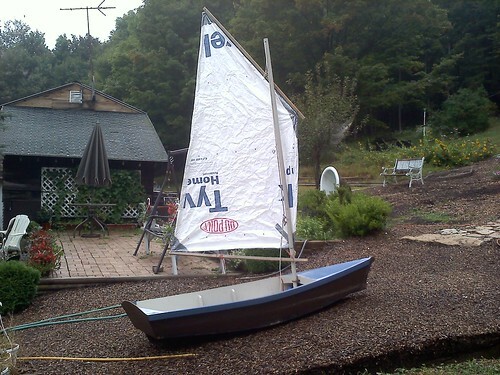 I never got to test the sail out in any real wind. I still hope to use this one like Dylan's duck punts. Use a paddle in place of a rudder and leeboard. I'd be reluctant to stretch her out past 15' though theoretically there might be an argument to be had for fabricating panels with three rather than two pieces, at which point I suppose length wouldn't be limited to what one could get out of two sheets of ply. I think it's an interesting challenge. It's not going to turn out anything particularly precious, but a solid, sturdy, plenty good-looking double-paddle canoe might come of it. I've got a couple of hull kits cut that are fairly similar in concept, though without the arbitrary time constraint. Since you don't mean a 24 hour boat building marathon (that might be interesting in it's own way, but a little pointless) then it should be considered that 3 work days is the schedule you actually have in mind. Unless there's a good reason for limiting each day strictly to 8 hours, then you could think of a less restrictive, though potentially exhausting, 30-36 hours over a long weekend. With that in mind, the methods you have in mind could yield something interesting and usable. You'd have to plan carefully, group all epoxy joints and 'glass reinforcement tasks late in the day so that you can take advantage of overnight cure time (assuming warm ambient temperature). Using the quickest, strongest construction adhesives and polymer brads, you could make short work of a basic chine-built 3 or 4 panel hull. I think CNC-cut parts would be the only way you could do it. 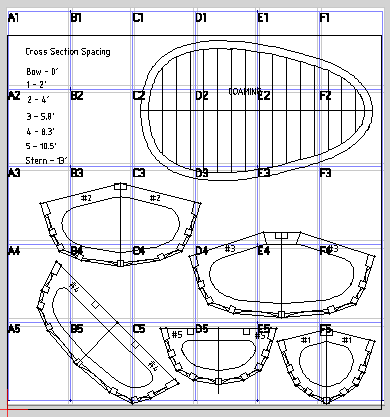 Laying out curves on plywood and cutting parts would take a big chunk of time and if you could start with parts that snap together into well aligned and accurate panels, you'd be ahead of the game. Even then, you'd have to do something like complete hull on day one, deck and fiberglass reinforcement on day 2 and sanding and finishing on day 3. I think the fiberglass part, even just taping the outside of the chines would be the thing that would stop you. There's no way you'd be able fair the joints and apply paint in one day. Use good marine plywood, skip the fiberglass and leave the chines exposed, paint the bejeeszus out of it and hope for the best would be about the only to get there. I think the marine ply and 2-part paint you'd need to even come close would blow your budget. Might be better to think in terms of a vacation-week boat. There are plenty of designs that you could start on a Saturday, blow and go all week and go for a paddle on the following Sunday. am i seeing correctly that she has a flat bottom w/ slight rocker? The Storer Quick Canoe is a good example of what can be done. 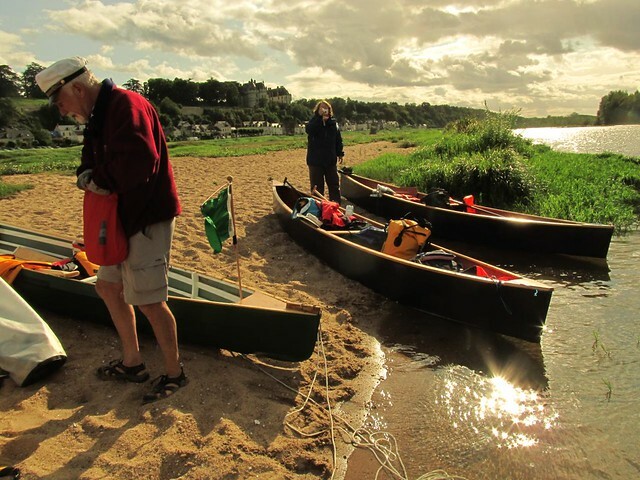 These canoes were built before setting off down the Loire. I think far too many boat designs demand far too much time to buid for busy young families. Getting on the water in a safe design is what matters. It's partly a creative endeavour ... there are a number of design and materials challenges inherent in it. I'd like to see if I'm up to the task. It's partly a social endeavour ... because I intend a simple build over a short period, it can include those who don't have the skills or time to participate in a more traditional form. And as a previous poster mentioned, it reduces the barrier to entry for school groups etc. There's a business aspect to it. In the past year the Ashes' shop turned out 9 canoes, racks of paddles, we prototyped landing nets and toboggans, completed two restorations, and laid the backbone for our first Whitehall. It's been busy and I've learned much; not the least of which is that a wooden boat is largely a luxury item and a 24 hour kayak (whether in reality it takes 24 hours or 36) would make my craft affordable for a much different demographic. And ... last but not least, there's very little invested in it. Not much more time than 1 long weekend and a modest amount of material; much of which in my case will be scavenged from offcuts from the woodbin. In any event, I won't be able to free up space until April at the earliest so there is time to plan. My first task, beyond soliciting feedback, will be to enter lines into Delftship and see what comes up. There seems to be an assumption here that the boat has to be covered in fiberglass. It isn't necessary if the plywood is half decent, and glassing adds a lot of time and expense to the project. It can also put off the first-time builder who's never dealt with epoxy. That Bolger boat I posted higher up can be cut out and assembled in no time. I did glue it up with epoxy, but other glues would have worked. If I remember correctly, I had everything marked up, cut out and mostly assembled in the first 8 or 10 hours -- the decks and cockpit trim went on later. I think I put about 30 hours into it, and I work slower than most. Realistically, this will be a disposable boat to get people started. Decent plywood and paint will make it work -- in fact, creativity with the paint job will be the most agreeable part and give the builder a unique if not museum-worthy craft. Even without the plasticizing goop, if stored indoors such a boat will last many years. BS 6566 Keruing and Meranti can be had for between $50 and $60 a sheet, both of which should hold up in a marine environment. 3M 5200 Adhesive can be had for $30 to $40 a tube and you'll destroy the ply before breaking the bond. Let's say a 16 run of 1x8 cedar supplies enough lumber for the chine logs, and costs $40. Mechanical fasteners at $20, pot of utility grade spar varnish for maybe $20 and shop supplies for another $20 and it costs out "close" to $250. Oh yeah, and a seat. Skin on frame would be faster, simpler, lighter, cheaper and easier to build. other than HOW DO YOU KEEP THE WATER OUT???? I have to agree that for a first time builder, a more familiar type of boat is a much easier sell. Also, SOF construction is a lot fussier than a simple ply boat. I'm surprised we disagree here. I've built many different boats and have found SOF to be the easiest, fastest, cheapest going. I agree with Tom Christie. I find SOF to be not only inexpensive and quick, but also enormously more pleasant from a woodworking standpoint. They also aren't captive to the inherent crudity in hullshape of a flat-bottomed simple plywood boat. Skin on frame is capable of great subtlety and grace, while still being ever so economical in cost of materials. It's the quickest and easiest path to a sophisticated hullshape. 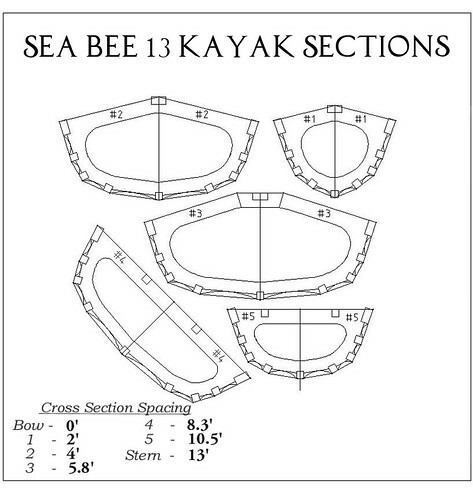 I've been looking at the Sea Bee 13 kayak by Tom Yost. I drew up the frames in a CAD program but never actually started it. I sure like the looks of a SOF when the skin is clear vinyl or even a translucent covering that shows the frame. If I build one, it will almost certainly be covered (temporary) with whatever waterproof plastic or tarp is laying around at the time but I would love to have a real nice and real light SOF kayak. I've never tried SOF building before but it looks like, if you had patterns to quickly lay out the frames, there isn't much to these boats. I don't think I fit the frames all on a half sheet of plywood in my drawings but it should take less than a sheet to build the Sea Bee 13. I rounded the space between all the stingers on my drawing. That is probably not needed on all of them. Something I always do on frame sections that are from the sheer line down to the keel. Good practice, even if the hull will not be leaned over that far. 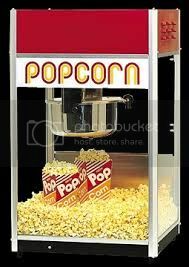 Here's a picture of what you could end up with. It would take 30 pages taped or glued together to make this. A light table or window would help to line the pages up. There's some wasted space but paper isn't real expensive. The separate parts could be roughly cut out of the paper patterns and glued directly to the plywood or to something else as a tracing pattern. Full size patterns should be much faster than lofting the lines directly on the plywood. I think the drawing is correct but no guarantees. I haven't tested this yet. P.S. I just fixed the link. First one I missed a little bit on the lower parts. Brian, I noted this comment: "I rounded the space between all the stingers on my drawing." If I understand what you're saying here, you drew a fair curve where the original shows scallops between the frame/stringer junctions. The scallops are critical -- if not cut, the skin will have hard vertical ridges at every frame. Tom, I don't disagree that "SOF to be the easiest, fastest, cheapest going." What I'm arguing is that for the first time builder, the ply kayak is an easier sell and more likely to get the would-be paddler building and in the water with confidence. SOF boats make non-boaters nervous. Heck, even some experienced kayakers look at my SOF boats and think it's a pretty dicey way to be heading out. It's also important to distinguish between the traditional and the fuselage frame approach to building SOF kayaks. The traditional approach requires some detailed work, in some cases cutting mortises, steaming and bending frames, and usually laminating a cockpit coaming. The fuselage boats can avoid all of these, and consequently require less skill and go together much more quickly. I'm sure I could have built a couple of ply kayaks in the time it took me to assemble my baidarka. I think I just explained it wrong. I offset the outside lines either 3/8" or 1/2" and drew a scallop between the stringers with the deepest point of the scallop (3/8 or 1/2") centered between the frame/stringer junctions. The top didn't get any scallops. Did you also recess the furthest point of the"scallop" about 1/8"back from the line between stringer points? That helps to avoid hard points poking in the skin at those intersections. That was a nice exercise but it is a waste of time to get it printed and then transfer the lines to the ply. Just do the layout on the ply. Skip the wasted step. That is what the SeeBee offsets are for. Curved lines between the stringers look nice, but don't add any strength, just make a straight line at 1/2 the height of the stringers. Cut the stringers into the ply at 1/2 height - you are finished. But you should be careful with the lower stringers at the front and back frames. The stringers will not twist. The offsets assume you can. Look at the angle of the lower stringers at the #3 frame. Then check it at the #1 frame. It is going to be different if you follow the illustration on how to cut in the stringer notch. I had to repair at least 4 stringer notches because of this. Good luck, and realize you can find a mistake (or something you done like) take what you have done apart and be back to a finished frame with very little wasted time. Second time to cut a frame is much easier than the first. Do you have any desire to build more than one? If so, when you have the frames like you want them, take the frame apart and make a pattern. I used 1/8" ply - cheap stuff. Reassemble the frame and make it permanent however you are doing the assembly. Last edited by upchurchmr; 01-18-2016 at 09:39 PM. I'm not sure what you mean. The scallop was all I drew up and it should go from right against the stringers to up to 1/2 inch away from the skin between the two stringers. Edit: I think the problem is I didn't erase the outside lines on my drawing. I used the feet (decimal) offsets and the measurements didn't come out to perfect fractions of an inch. Drawing it in CAD and printing it out full size got around those tricky measurements. I suppose the metric would be much easier but I'm still fighting the switch. Blame the US public school system. My dream is to be able to see the frame sections and stringers through the skin so the curved lines (especially the upper ones) were mostly for looks. I figured the slight curves wouldn't be any harder to cut than the straight ones. I haven't done any more than computer drawings of this boat. If/when I build it I will keep in mind that some of the stringer angles probably need changed. It depends on how my first one turns out and how hard or time consuming it is. I could see building more than one if I like it. Having an extra boat could allow someone else to join in the fun. The light weight is the biggest draw for me. One of my favorite boating spots requires carrying the boat down a steep bank to get to the water and carrying it back up the hill when done. That's why I love my self designed, one sheet boat so much. I can easily carry it around by myself but it still takes a couple trips to get the mast, sail, and all the other sailing parts to and from the water. Hopefully the SOF kayak will be lighter yet even though it is considerably longer. It should be faster than my flat bottom, one sheet boat and hopefully faster and lighter than my shorter plastic kayak. I recommend that you do it just the way you want. It won't be an heirloom, you'll learn a lot, and your next one will be so much better. Plus you'll piss off a bunch of those "naysayers". All in fun, of course. I guarantee the SeeBee will be faster than your plastic SOT. My friend took the SeeBee I made for him out with a same length SOT. The friend is a Canoe instructor (Boy Scouts) and his son was an underdeveloped newbie. The friend was on the SOT and was struggling to keep up after 20 yards. Any way you build the frames will work. I was just trying to make it easier (to me). Here are those other pictures of the model ... they'll show the possible lines more clearly. To my eye, a 4 panel boat does have the potential to be a pretty thing. For the most part I'm following a well worn path; she's just over 15 ft at the waterline and a tad under 23 inches at her beam with 3 inch rocker fore and aft. I just might make this asymmetrical to avoid the need for a skeg (thoughts?). I also foresee difficulty in handling the deck/cockpit transition; in order to get a nice camber out of a single panel the model required some cheats just aft of the cockpit. I suspect I'll have to design in a relief "dart". And the cockpit too, will need some careful consideration. Any fitting will need to be greatly simplified, yet at the same time with an open cockpit a coaming feels to me essential. Last edited by tpaetkau; 01-23-2016 at 11:51 AM. sweet lines! the after deck transition is quite attractive to my eye. might it be simpler/quicker to have a V instead of a rounded front/combing/splash rail? Actually, now that I think about, flat bottom and all, she will need a skeg.